This has been a strange month here at the Limón household, first the fridge broke and then the new one that we got never got cold which turned into a saga with Maytag and Home Depot, then the garage door broke into pieces, the cable went out, and now we’re having technology problems. Lately it’s felt like the house is coming down around us. Lucky for us the wine I’ve opened for the blog this month has been stellar and this is another wine that, unlike the rest of the stuff in the house, simply works. Drew Wines has been on my radar as one of the small California wineries that craft transcendent wine. Back when I was into Anderson Valley Pinot (full confession, I still love the stuff) I was happy to learn that Drew was setting up a tasting room in Philo and had opened a new site of operation and home base in Elk. 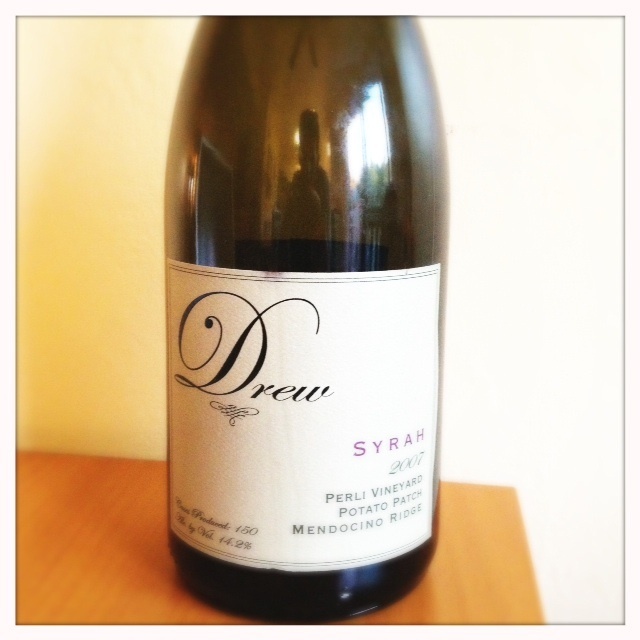 As I developed more of a palate for Syrah I was excited to learn that Drew’s winemaker, Jason Drew, was also interested in Syrah and had been making Syrahs from the Mendocino Ridge appellation which lies along the coastal areas west of the Anderson Valley. These are not exactly cheap wines but they are really well made and have a vibrancy and energy to them that you don’t often get in Syrahs from warmer climes. Again, although Pinots from this area sell in the $40 and above range, the Syrahs sell for the $20 to $40 range. Jason Drew got his start at St. Supery Winery as an intern, then worked at Carmenet Winery in Sonoma from 1992-1995. He then went on to work at Navarro winery in Anderson Valley as vineyard manager. Drew decided that he needed a more formal education in wine and headed to Australia to get his enology degree at the University of Adelaide. After finishing his degree he returned to the states to take a job in the Santa Rita Hills at Babcock Cellars as assistant winemaker. He began his own label in 2000 and with a strong belief that Pinot was the wine with which he could make a living, he moved the winery up to the Mendocino Ridge AVA near the town of Elk in 2003. The move north gave Drew and his family the chance to be close to what they considered some of the best Pinot fruit in California. Also believing that cool-climate Syrah in California can be grown hand in hand with Pinot, and perhaps as a nod to his days in Australia, he was interested in seeing what he could do with that variety. The Perli Potato Patch Syrah has beautiful gravel and dark plum (almost prune) or salty plum aromas. There are also strawberry aromas on the nose. The fruit is bright and elegant. The palate on this wine is sweet, savory, and full all at the same time, with a nice acidic lift on the finish. The tannins are not sharp but rather sweet. It’s a beautiful wine, with an underlying earthiness that gives the fruit some contrast. It’s very balanced and complete. As I mentioned there is also a verve to the wine that makes it seem to dance on the palate. This is one of those difficult-to-explain characteristics that I’ve found with well-made cool-climate Syrahs – there is sort of an energy on the palate. I haven’t quite parsed out if it’s due to the minerality or the acidity but the wine doesn’t just sit heavily on your tongue, it’s light and almost wild on the palate, just like an acidic Pinot or white wine would be. Interestingly, this wine is from the same vineyard as the Donkey and Goat 2009 Perli Syrah. Even though the wines were made in different styles (one more modern and the other in a natural style), they are very similar wines. This similarity must speak to the characteristics of this vineyard and it will be interesting to keep comparing them in subsequent vintages. This is a fabulous wine and I’m so happy that even though Drew Wines mostly makes Pinots, they’ve continued to make Syrah and it continues to be delicious. I hope you’ll seek them out as a great example of cool-climate Syrah in California. Thanks to Prince of Pinot for his audio interview with Jason Drew. One of the coolest things for me about Waxwing Winery is that it’s located here on the Peninsula. Few wineries exist around here and it will be fun to get to know this place. It’s a small little building that strikes a different chord in the middle of all the industrial buildings of San Carlos. Waxwing Winery shares the space with another winery called Cuvee Cellars. At the moment the owner of the other winery is redoing the façade in the main building to make it look more like an actual winery — they’ve add tile and an arch, and in front they’ve planted a few grape vines in old oak barrels which contrast with the surrounding expanses of white concrete. Waxwing Winery is another example of the budding urban winery movement in the Bay Area of the last few years and it’s high time the Peninsula benefited. Waxwing’s owner and winemaker, Scott Sisemore studied at UC Davis and began making wine at Ravenswood and Rosenblum many years ago. More recently he worked at Pellegrini Winery in the Russian River as associate winemaker. After years of his wife commuting from the north down to her bio-tech job here on the Peninsula, the couple decided it was time to move closer to his wife’s job as they were starting a family. So they packed up and moved all his experience to Belmont, California. Scott was able to spend more time with his newborn and decided to start Waxwing as a small lot winery dedicated to Pinot and Syrah from the Sonoma Coast. Wineries here on the Peninsula are few and far between so it was great to see that Scott is really trying to develop a local winery, with events and tastings in San Carlos. Scott is also trying to develop a winery that matches the Peninsula’s family-centered culture and includes activities for kids when hosting tastings. 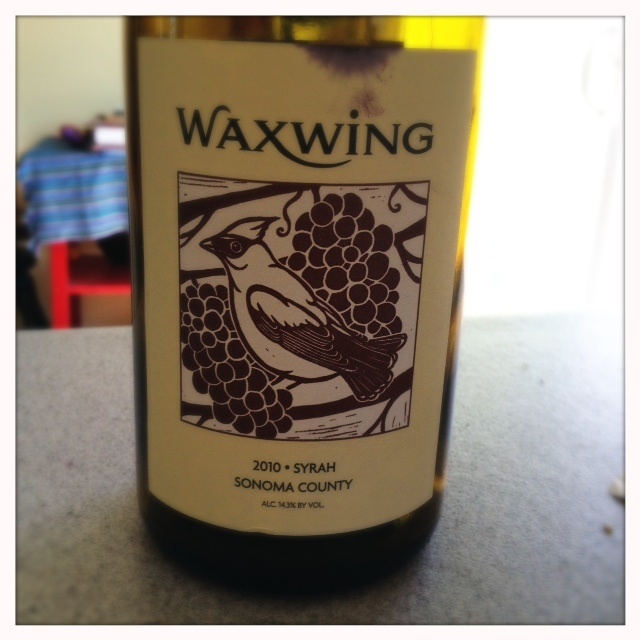 I can’t believe I hadn’t heard of Waxwing Winery until Jon Bonne’s “Syrah on the Sonoma Coast” article but I’m so glad to have found it now. The Waxwing Sonoma County Syrah is a blend of two thirds Syrah from the Sonoma Coast appellation Flocchini (Petaluma Gap) vineyard and one third Syrah that Scott purchased from Geyserville. In 2010, he picked a little earlier than normal and made the discovery that the wines simply didn’t have the backbone that he had hoped. He felt that the Geyserville fruit that a wine-maker friend had offered him would round out the wine nicely and he jumped at the chance to purchase the barrel. In order to make a more complete wine, he was forced to forgo the ability to call it Sonoma Coast. The result is a wine that has some of the elements of a cool-climate Syrah with a core of juicy fruitiness provided by the Geyserville fruit. It doesn’t have the feral meaty aromas that I love so much in Syrah grown in cooler climes but it does have some stellar plum, blackberry, and floral aromas. There’s also a fair amount of gravel aromas and scents of that trademark cool-climate black olive. On the palate, this Syrah is an elegant wine with nice minerality and acidic lift. The finish is not too tannic but it does have a little punch from the acidity. That same minerality on the mid-palate lingers on the finish. It’s simply a delicious wine with a light touch for Syrah. In some ways, the elegance reminds me of a Pinot and makes the wine a perfect match for light food. As far as the winemaking process goes, Scott uses French Oak barrels that have been used for one year. He does about 10% to 15% whole cluster fermentation on the Flocchini fruit. The wine he purchased from Geyserville is aged in new oak but the oak isn’t too present for my palate. In 2009, Sisemore made a Sonoma Coast wine exclusively from the Flocchini vineyard that was favorably reviewed in the Chronicle by Jon Bonné and I’m hoping to get a hold of a bottle soon to do a comparison between the two. It’s not quite the cool-climate style Syrah that I was hoping for but it still has a pretty elegance that many Syrahs don’t have and after talking to Scott, I’m convinced he made the right choice by adding the Geyserville fruit to this blend. I’m looking forward trying more wines from Waxwing Winery, and I’ll definitely be bringing my three-year-old to their family-oriented tastings.